Outdoor living spaces have grown in popularity as an extension of the home. The challenge of making your patio look more like the inside of your house has designers, contractors and homeowners thinking out of the box on a grand scale today. Yards, decks and roof tops are being used to their utmost potential. 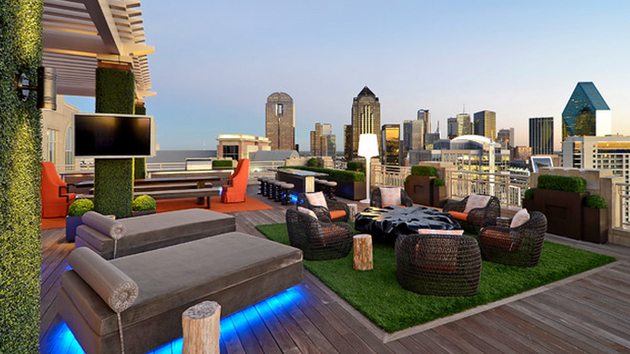 (There are more than 80,000 roof top patio designs currently posted on Houzz.com!) 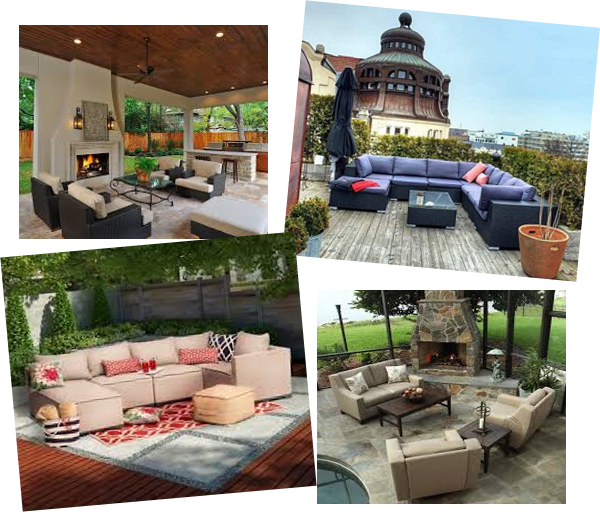 Four of the hottest outdoor living trends this summer is seating, heating, lighting, and cooking. Gone are the days of decorating with a few patio chairs around an umbrella table. The line between outdoor and indoor furniture is getting tougher to distinguish, especially with the use of upholstered pieces outside. Fade and weather resistant fabrics that are not only durable, but also washable, have made outdoor patios as comfy as our living rooms. Built in seating options, such as ledges, benches, steps, and boulders, are also quite popular and can double as beautiful landscapes too! 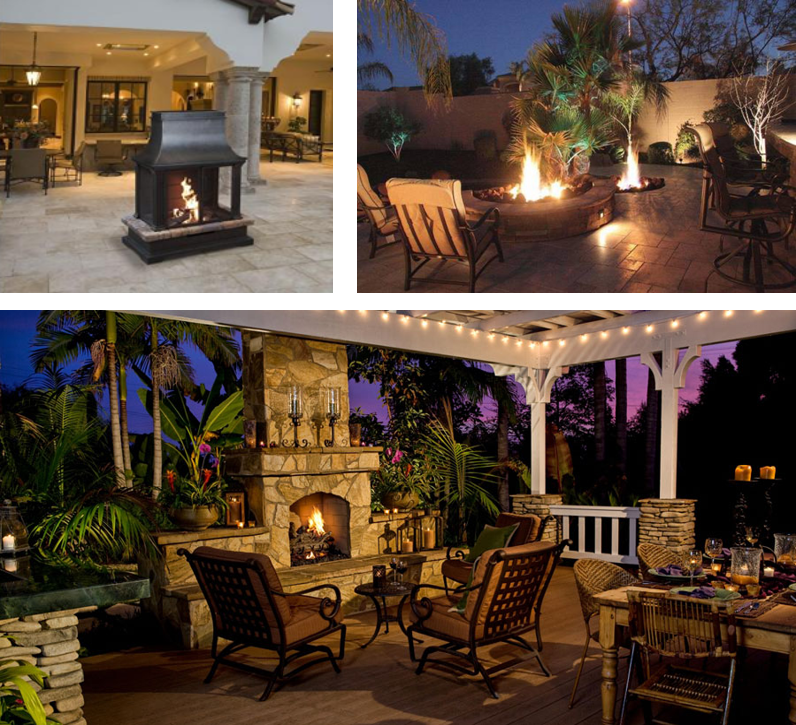 One of the hottest trends in patio anchors is the outdoor fireplace or fire pit. 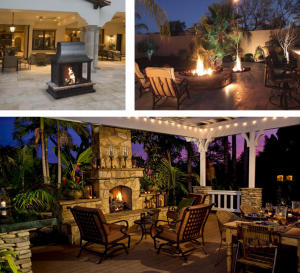 Outdoor fireplaces add ambiance and value to your outdoor space and warmth on chilly evenings. You can instantly give your patio an upscale look with a customized fireplace and mantle using brick, stone or wood. Fire pits also offer a cozy respite. Current designs may include decorative stone, marble and/or fire resistant brick and can be gas or wood burning. There are a wealth of outdoor fireplaces and pits on the market. A quick search for “outdoor heating” at HomeDepot.com will give you a feel for the many varieties and styles available today. You may also consider working with a professional masoner to custom build your perfect outdoor look. Multiple layers of outdoor patio lighting is all the rage this summer —it will give your outdoor space a welcoming, finished and secure feeling. Begin with the perimeter of your outdoor space by filling the area with wall mounted ambient lighting and/or ceiling fixtures when applicable. Create additional layers of light for the cooking and seating areas and along the landscape lines and paths. Use rope and string lights, candles, sconces, lanterns and solar pieces to create a warm and inviting glow. Outdoor cooking is being fed by the popularity of cooking shows, “foodies” and easy access to the plethora of culinary information on the web. One of the hottest trends in outdoor cooking is the Kamado style grill or smoker. Based on ancient technology, most Kamado grills are made from ceramics, able to retain heat for long periods of time. The significant advantage in cooking with the Kamado or ceramic grill/smoker oven is that your meat will be unbelievably moist and tender. Other niceties such as refrigerators, stoves, brick ovens, wet bars, and sinks are also big. 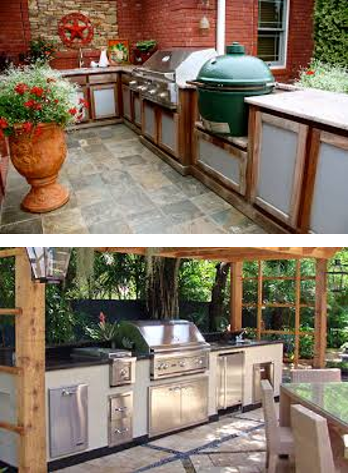 Outdoor Kitchens are the cornerstone of today’s outside living, cooking and entertaining trends. Bringing the indoors outside is a transition that continues to evolve and gain popularity. From kitchens and furniture to stylish lighting and cozy fireplaces, applying inside amenities to outdoor living is on trend. 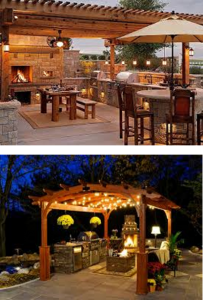 This entry was posted in Carpentry, Design, Masonry, Outdoor Living and tagged Custom Patios, Fire Pit, Fortune Restoration, Kamado Grill, masonry contractors chicago, Outdooor Furnishings, Outdoor Design, Outdoor Kitchens, Outdoor Lighting, Outdoor Living, Outside Fireplace, Patios, Roof Top Patios on June 2, 2015 by admin.